Having a way to keep the vision of what you wish to create, up close and on your mind, is really important. And for a lot of people, their go-to tool is to create a vision board. Me? I'm not a vision board gal. That’s never been a tool that has fully resonated with me. So, this past year I went looking for a way to keep my vision active in my mind. But not just the vision, I also wanted to stay present to what I needed to do to make that vision manifest; tasks and goals that would get me into action. What I found was the chalkboard method, a simple goal tracking process. But instead of just mapping out goals derived from my mind, I’ve approached this from a more intuitive perspective. Intuitive goal setting and vision planning needed to merge… I mean I am me after all! I really like this process, and so if you’re thinking about how you want to grow this coming year and starting to look at goals, you might want to get yourself a board and try this. So in this episode, I’m talking about how I do this, what my process is. I share how to blend your deeper intentions and the steps you need to take to make those happen. 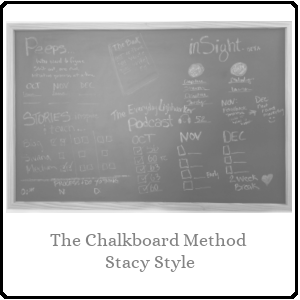 The “Chalkboard Method” podcast from Being Boss. A Pinterest board of chalkboard inspiration.